Unlike last summer, this summer has proved to have been a relatively mild one. Much like last summer, though, I have turned into a fierce ice cream maker (and eater, obviously), churning up a whole lot of ice cream and sorbet like a machine. While I was keenly making sorbets last year, this year I have been all about fruit-based, honey-sweetened ice creams and sorbets. I started with melon, and used it as a 'basic' recipe, and tested and re-tested over and over again. Meanwhile, I also experimented with other fruits, too, including pineapple, kiwifruit, watermelon, orange, and peach. Although most of them made decent ice creams, some were a bit of disappointments, and the biggest one of all was, to my surprise, peach. I love peaches, white or yellow, cooked or uncooked, simply sliced or in the form of dessert - especially Japanese ones. 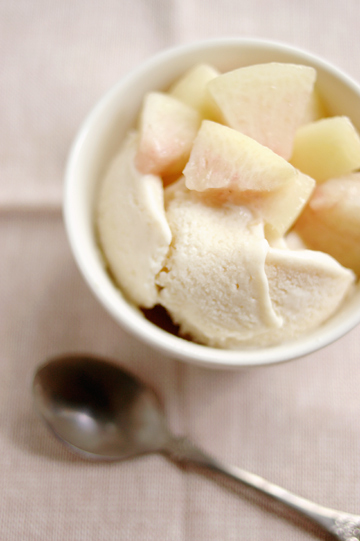 I love peach ice cream (this one in particular), too, but mine didn't turn out nowhere as good - at least in the way I had made that worked with many other fruits. It's not that it tasted bad, but it just lacked flavor desperately; the flavor of peach didn't come through, nor was there the flavor of anything else, really. It could have had more to do with the somewhat poor quality of the white peaches I had used to begin with, but I felt that it needed something to add a kick to it, be it a spice or a herb, or maybe some other fruits, even. I could have re-tried it, adjusting the amount of ingredients and/or adding something else. Or gone looking for something completely different. But what I wondered as I first tasted it was this: wouldn't it work if I simply replaced the cream with yogurt? Because Japanese peaches tend to be really sweet and juicy with a hint of bitterness, but hardly any tartness. And that's where the tang of yogurt would fit in, I guessed. So I went ahead and gave peach-yogurt ice cream a try, though it was now more of peach frozen yogurt. I used thickened yogurt which is plain/natural yogurt that has been drained overnight in a paper towel-lined strainer, to give my frozen dessert a concentrated flavor of yogurt. The rest was mostly the same with the fruit-based ice cream; puree the flesh of fruit, add honey and spirit/liquor, and freeze, process in the blender, freeze again, and so on. Simple enough. Verdict: pretty good. A simple swap between heavy cream and yogurt worked wonders and created a silkily smooth, soothingly icy treat that was satisfyingly peachy and pleasantly tangy. 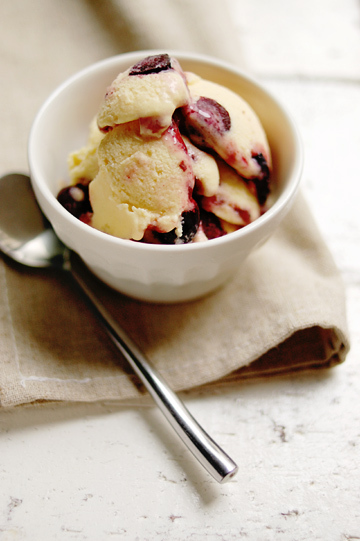 Swirled into the yellow peach-based yogurt base was some blueberries that had been stewed briefly with a bit of honey and juice of lemon, added at the very end, right before the final round of freezing, making blueberry-swirl peach frozen yogurt. I would have liked to make it with white peach and raspberry, but I was out of frozen raspberries (and there was no way I could use fresh ones here, for fresh raspberries are usually outrageously expensive around here), so I went for blueberries, which are increasingly available at reasonable prices. I also used yellow peaches for this one, for that was what was on sale at the time I shopped. I must admit that the blueberry part had a slightly funny taste, possibly due to the particular honey that I had paired with it, but not sure. I'd love to give it another try when blueberries come in plentiful again - just in ten months or so. Sigh. In the meantime, I wanted to try the frozen yogurt with some other fruits, too, and I'd wonder what would work well, as I walked down the produce aisle at a local supermarket one late August day. Maybe bananas, or pineapples, perhaps? I was sure berries of any kind would work, but nothing was available at a price that would justify a purchase. Then my eyes fell upon figs, which had started to become cheaper and better. 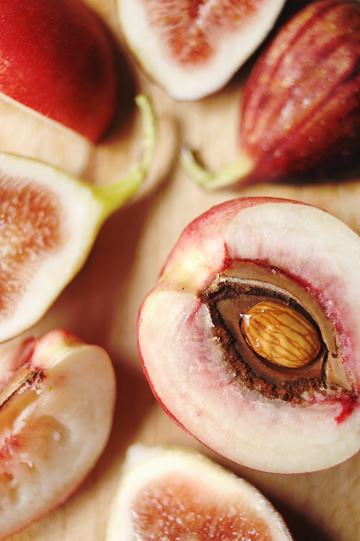 I wouldn't normally associate figs with peaches, but when I thought about the flavor factor (i.e. a general lack of kick, especially tartness), they seemed similar and it seemed to make sense to try the frozen yogurt with figs. I was going to do it with figs only, but at the store they happened to sit right next to white nectarines, and I grabbed a pack of them without hesitation. Back home and standing in the kitchen, I thought, well, why not using both figs and nectarines? As much as I'm very partial to Japanese white peaches, I also adore white nectarines very much. I first had them in Hawaii, I think, but the first really good ones I had were those in Australia when I visited there in 2006. Sweet and juicy, firm but not stone-hard, they were the closest thing to Japanese white peaches outside of Japan - rather more so than regular white peaches were (except maybe doughnut peaches). I had never seen white nectarines in Japan until this year; as far as I know, nectarines here are all yellow, and they aren't even labeled as white or yellow, for there was no white. So I was really excited to find them at the store this year. The combination of peaches/nectarines and figs isn't something that would come to my mind naturally, but I happened to have seen a recipe for white peach and fig granita in a food magazine, so I decided to go ahead with them. I went with about half each of the two fruits, but my white nectarine and fig frozen yogurt came out definitely more figgy than nectarine-y. While the simple peach frozen yogurt was as light as a feather, this one here was just a notch richer with a hint of musky aroma of fig, making it a favorable late summer/early autumn treat. The above-mentioned granita, by the way, was from the last December/January issue of donna hay magazine (#42, 2008) that I'd bought back in this past March while in London. Though it was essentially a Christmas issue, being a southern hemisphere-based magazine, it was full of summery recipes, including some with peaches and nectarines. I remember reading this in London, when the air was just about to become warm there, longing for the stone fruit season. And can you believe it is almost over? Not fair! Anyhow, because I had white nectarines and figs at hand, I might as well would do the granita, too, I thought. Hence white nectarine and fig granita here. 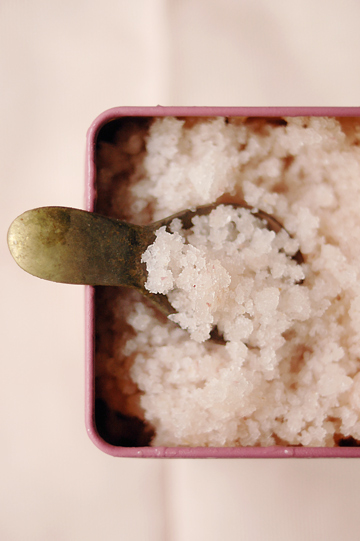 Like most granita recipes, this one was fairly simple to make. You puree some white peaches (or nectarines, as I did) and figs, and add sugar that has been dissolved into water; here are not required to cook up sugar and water until syrupy, just until the sugar is dissolved. Pour the mixture into a tray and pop it in the freezer, stirring it now and then until all frozen and icy. Except this time, in keeping with my recent obsession with making honey-sweetened frozen treat, I replaced the sugar with honey - and simply added some water, just to thin down the fig-nectarine mixture that was quite thick when pureed. I also added a bit of gin (which has replaced vodka as my choice spirit to use in frozen desserts) and some juice of fresh ginger, although that was hardly noticeable in the granita. It still tasted good, though. 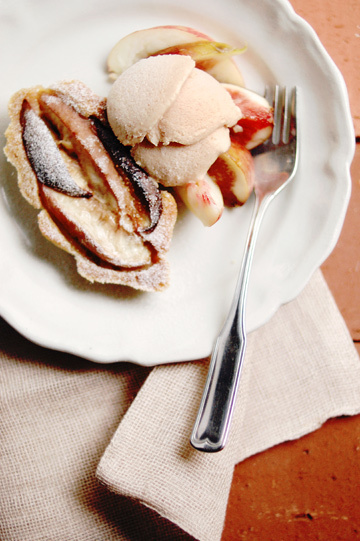 As I had yet more figs and nectarines left, I made a little extra effort and did one more thing with them; baking. Yes, it has finally become cool enough to fire up the oven. 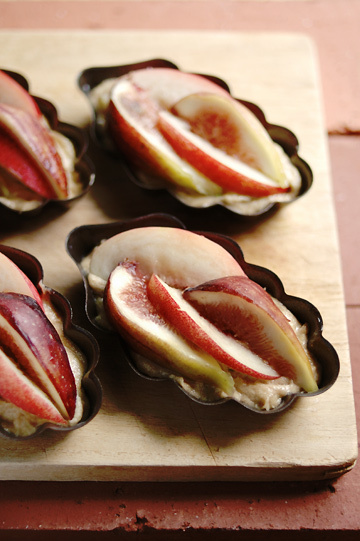 I love baking with figs. And it looked as if everyone was baking up figs in the blogsphere these past week or so, and I was itching to do my share - at least a bit. I would have liked to do something a little more elaborate to showcase this beautiful early autumn goodness, but for now I settled with something simple and rustic, which is to say, my kind of cake. As it happens, the stone fruit feature article on the said issue of donna hay magazine had a recipe for lemony peach cake, which was more or less a simple pound cake with a good dose of grated lemon rind and a bit of yogurt added to it. It sounded good and looked fairly simple to make. So that made my cake of the day, except I topped it with figs and nectarines in place of yellow peaches as used in the recipe. I really came to take a liking to the fig-peach/nectarine combo! And oh, I also substituted brown sugar and whole wheat flour for white sugar and flour, respectively. 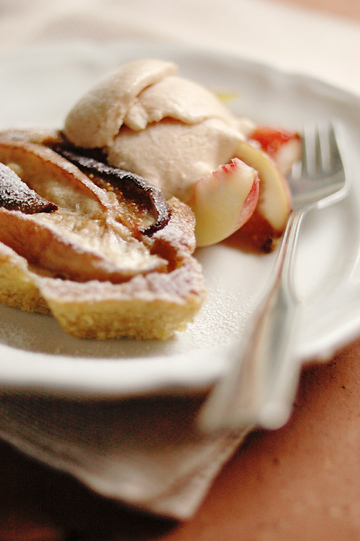 Baked in small individual-sized pans and dusted with confectioner's sugar on top, my lemony nectarine-fig cake made a rather pretty afternoon treat, especially with the nectarine-fig frozen yogurt as well as fruit wedges alongside. The cake was light and nicely spongy, and tasted fairly good, which came as a bit of surprise to me, to be honest. The thing is, I can't really say that I have always been successful with Donna Hay baking recipes. I admire her beautiful magazine, and her recipes for savory dishes have usually worked alright - just not baking recipes. The ones I've tried have produced a varying degree of success, with a rather high chance of disappointments, as far as I am concerned. Maybe it is just me, but who knows. So my hope wasn't sky high when I was baking this cake, which would have been what made all the difference. But I enjoyed the cake, as its tiny last sliver of residual heat melted the frozen yogurt, tuning into a nice sauce for the cake. And I'm looking forward to baking more with figs for the coming few weeks. Now I'm leaving you with a brief note on how to make my frozen yogurt, in case anyone is interested. All amounts are approximate. Makes approx. 1 1/4 cups / 300 ml frozen yogurt. 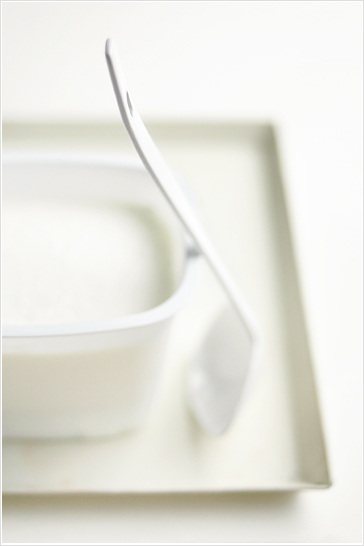 First, drain the yogurt by placing it in a large strainer lined with a double layer of paper towel and, set over a bowl. Cover and leave it overnight in the fridge. It should yield approx. 1/2 cup / 120 ml of thick yogurt. Keep chilled until ready for use. Meanwhile, using a blender, puree the peach chunks with the juice of lemon, and measure out approx. 3/4 cup / 180 ml / 180 g of puree. Add 2 Tbs. of honey and gin, and mix well. Pour the mixture into a freezer-safe container, cover and freeze until almost firm, 3-4 hours or overnight. 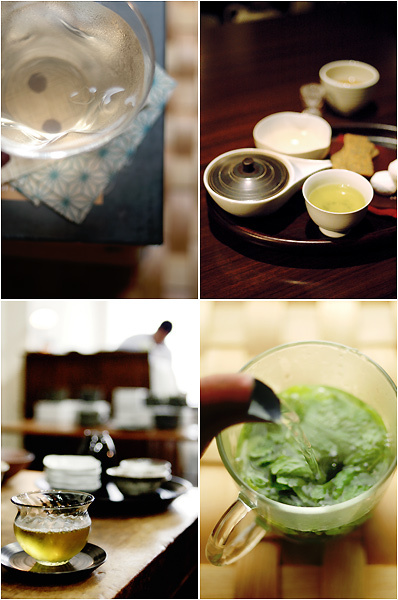 With a metal spoon, break the frozen mixture into pieces, and process until the mixture is smooth in the blender. 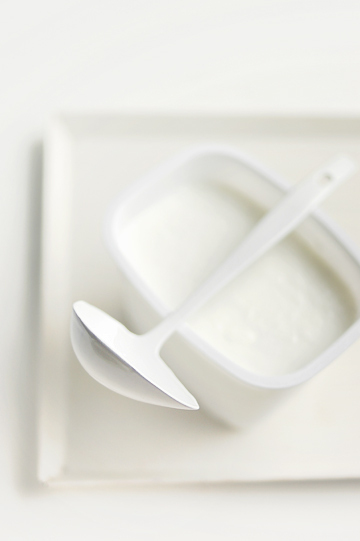 Add the thickened yogurt and process further until thoroughly combined. Pour the mixture back into the container, cover and freeze for another 3-4 hours, or until almost firm. Process once more until smooth, and taste; add another Tbs. of honey if necessary. Freeze again for further 3-4 hours or until ready to serve. - This may seem to make some odd amount of frozen yogurt, but this was the way it worked around here; most store-bought plain yogurt comes in a 400- to 450-g tub, and peaches are large and weigh 8-9 oz. / 230-250 g or so. I also tend to make desserts in a small amount, too. Feel free to adjust the amount to suit your needs. 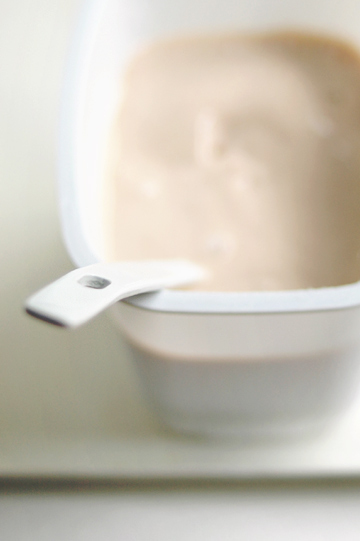 In general, up to about 1 cup / 240 ml / 220-240 g peach puree should work fine with every 1/2 cup / 120 ml thickened yogurt. - I don't use an ice cream machine because I don't have one. If you do, though, by all means use it - just combine the pureed peach mixture and thickened yogurt and churn according to the manufacturer's directions. You may also use a food processor or an immersion blender to puree and smoothen the mixture, although I have not tried them myself; either way, make sure that your choice of machine is sturdy enough to process ice. - Either white or yellow peaches work fine. You could also use nectarines. 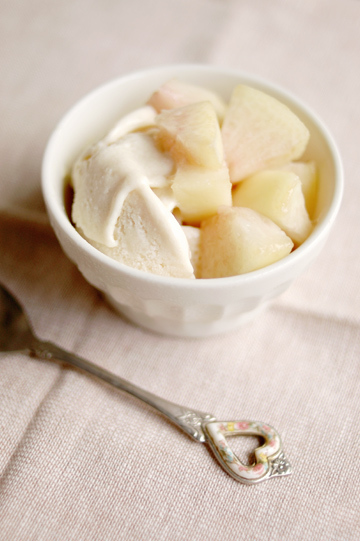 For the white nectarine and fig frozen yogurt mentioned above, use a white nectarine and a fig or two for a combined 3/4 - 1 cup / 180 - 240 g of puree. what gorgeous pictures! I LOVE ice cream/forzen yogurt and your pictures make them look like heaven, such talent. mmm... they all look so good! I loved the ice cream recipe and I will try it with my yellow peaches tomorrow. I haven't got a ice cream machine either and never make ice creams but you are such an inspiration. Besides, today I went to the market with my daughter and the peaches were beautiful, she doesn't like white peaches so instead of a basket of six big white Spanish peaches we bought a basket with 12 yellow ones...They are sweet and have a gorgeous red skin. the yellow peach ice cream is, so far, delicious. It is freezing right now but it tasted so good, so good, so good, it is a great happiness for me. I have kind of followed your measurements but since I had a left over of 250 grams of thick Greek yogurt I calculated the amount of peaches to match it all. I used 1 tbsp of vanilla bean flavored cachaça (Brazilian spirit bottle I've been filling with empty pods) because it was the only one I had at home and some acacia honey and the puree tasted like heaven. Wonderful. I couldn't imagined it would be so good, the Spanish yellow peaches played their role well, of course. Your frozen yogurt and cake look so beautiful. 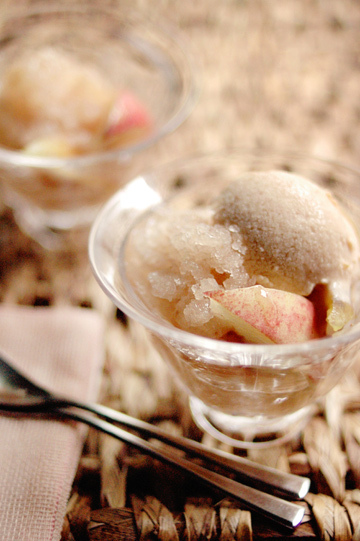 Your nectarine and fig granita looks delicious. I wish the end of summer wasn't so close! Aww, this looks so pleasantly cold and delicate! I love the picture of the nectarines!